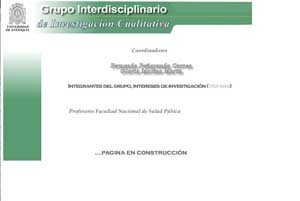 This site is a group of professors and researchers of three University in Medellin Columbia, that started to work together for planning ADIS 2008/ QI2008. All of the members teach qualitative research at their own universities. Some of them are leaders of research groups, that are disseminating qualitative research in different areas. All of them have a commitment to promote a type of research that looks for social justice and are working in new ways of understanding research ethics.